YouTube is amazing and I just love the concept of "Broadcasting your self" and utilizing a platform to see your dreams become a reality. I've had a YouTube channel before I started with BloggingeHow where I used to put random videos (ranging from video intros, to Adobe after effects tutorials, to 3D modelling, Auto Tune songs and what not.) Ever since then, I have a close affection with YouTube but I never utilized YouTube for BloggingeHow to extant I should have done. I accept this and this is the very reason why I turned over a new leaf with YouTube to broadcast my fitness side with the help of YouTube and Facebook page, to inspire other fellows to stay healthy to change their life. Well, this is going of topic here. With a great YouTube channel, there comes a well designed cover art, which is basically the main poster/cover image that defines the header of your YouTube channel. A thoughtful YouTube channel cover can make or break the chances to increase followers. As I had to design my own cover for my fitness YouTube channel, I looked for the perfect dimensions in pixels which would satisfy the look on all the electronic devices, may that be mobile, TV, tablets or computer/labtop screens. 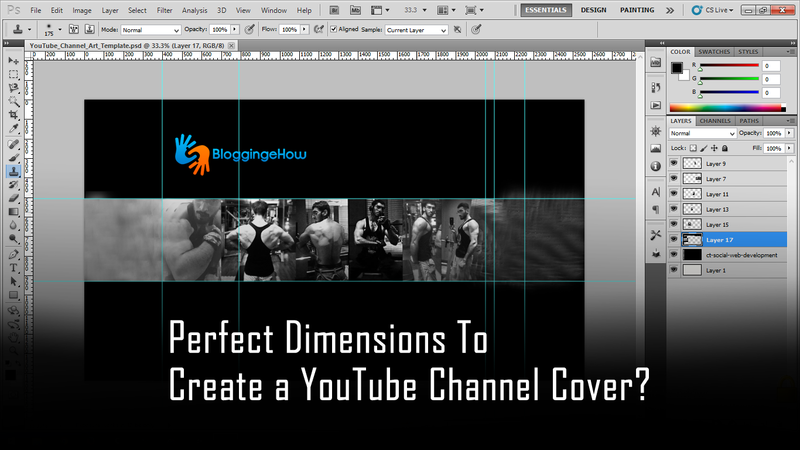 So I found out that the new YouTube layout has the following cover image dimensions that we can use to design our own. 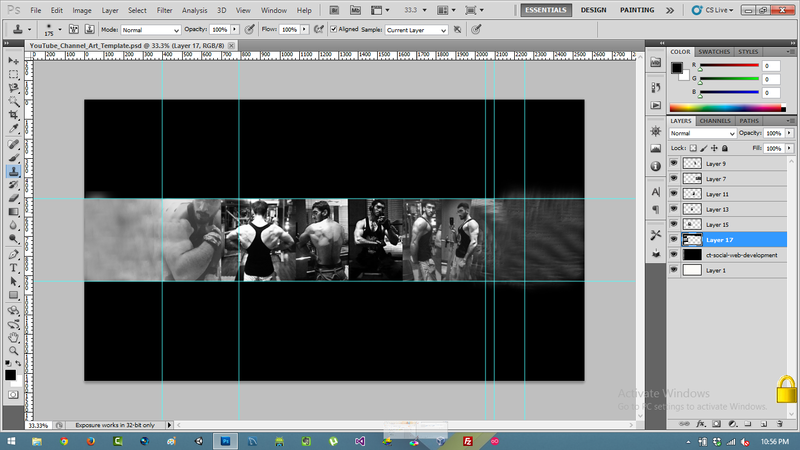 In fact, I have a link to a great PSD template (Photoshop) that you can use which has all the margins set. 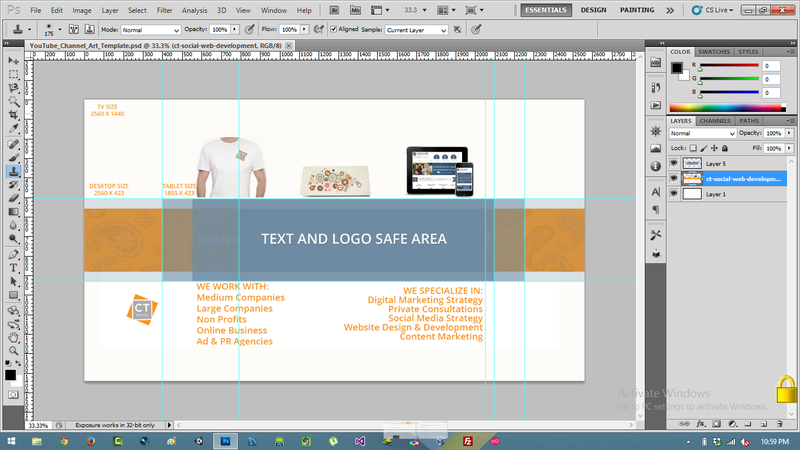 There are in the above image that says "Text and Logo Safe area", is the best and most suitable section to put your tag lines and insert a logo. In fact, the entire horizontal orange section is the must add area that you should design on priority as this is what will be displayed on the mobile devices and laptops. Below is the download link that you can use and make a stunning looking YouTube cover art that rocks on all the devices that it can be possibly view on. Personally, I only designed it currently for Mobiles, Desktop/Laptop screens, though there is always a room to improve and jump up the game. You might see more iterations of the above YouTube cover on my Fitness Facebook page and my YouTube channel. I hope this would help you out in coming up with stunning and marketing oriented cover graphics. Yesterday, I posted a post that went though my typical day and how exactly I manage my time. If you're facing time managing issues, make sure you check it out.